Of all the cities in France, Marseilles is the oldest. It was founded 2,600 years ago by colonists from ancient Greece. This comes as something of a surprise. Many would likely guess Paris as France’s oldest city, since it is by far the nation’s largest, most famous and important city, but Paris was founded three and a half centuries after Massila, as Marseilles was then known. 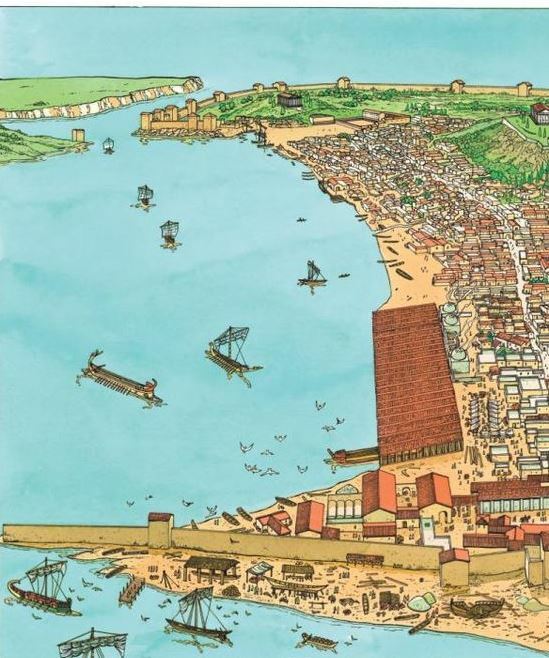 This first city on what would eventually become mainland France was a colony created by the Phocaeans. These Greek people hailed from the Aegean coast of eastern Anatolia (part of present day Turkey). They were known for their extensive exploration of the Mediterranean. According to Herodotus they discovered the Adriatic Sea as well as parts of the Italian and Spanish coasts. Classical civilization traveled with the Phocaeans across the Mediterranean onto the shores of France. This colonial foothold would later be exploited by other Empires, most prominently the Romans as they expanded into Gaul. Antiquity is something that Marseilles is rightfully proud of. The city was part of ancient Greece for six centuries, almost the same amount of time that it has now been part of France. Both before visiting Marseilles and after arriving in the city, I read numerous accounts that referenced its Greek origins. This left me wondering about Massilia. What if anything could be learned about pre-French, pre-Roman Massilia? Were there any physical remnants left to see from that period in the city? My search to learn more about Massilia started where so much of classical history does, in legend and myth. The city’s founding is told by a story that mystifies and enlightens. It is not surprising that Massilia, a colony located on the classical world’s very fringes, has an early history based on legend. Its founding at the beginning of the 7th century BC lies deep within an age where written accounts concerning it were rare. History, like power abhors a vacuum, thus myth acts as a substitute for the lack of factual information. The legend goes that a Phocaean explorer by the name of Protis happened upon the Lacydon, a cove that was framed on each side by rocky peaks and fed by a freshwater stream. It was here that he received an invitation to a banquet being held by a Ligurian chief. The Ligurians were the people who inhabited the region north of the cove. The banquet was to decide which man would get to marry Gyptis, the chief’s daughter. Protis was chosen by Gyptis, who then gave him a ceremonial cup filled with water or wine (accounts vary). The happy couple decided to make their home on a hill north of the Lacydon. From these beginnings the city of Massilia evolved or at least that is how the story’s told. Whatever the case, Massilia grew into a major trading port where a merchant class grew wealthy trading in such local products as cork, coral and wine. The city was home to two great temples, dedicated to Apollo and Artemis, demarcating its northern and southern ends. These structures were signs of the great wealth that Massilia’s traders were able to accumulate. A couple of centuries after its founding the city had a population of 6,000, a metropolis of the northern Mediterranean during that age. Massilia drew the attention of such famous personages as Aristotle who wrote about its government. The city was as an aristocratic republic, governed by the wealthiest ten percent of its citizenry. Cicero wrote that Massilia was ruled by wisdom. Its most notable son was the mathematician and astronomer Pytheas who was the first to ascertain that tides were connected to the phases of the moon. Pytheas must have spent a good deal of time studying the comings and goings of the Mediterranean at the shoreline in Massilia. Many things have changed since that time, but not the sea which still washes the same shores. The sea that Pytheas studied was the one I watched sunlight shimmer on, transforming the water’s surface into flashes of silvery fire. 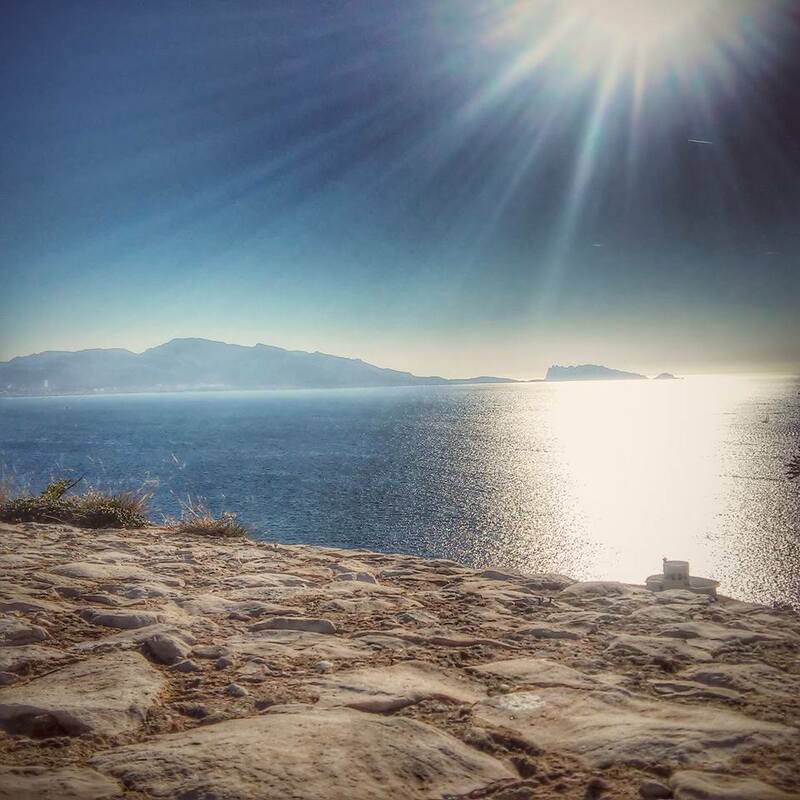 This was the eternal glow of the Mediterranean, a natural magnet to eyes both ancient and modern. Classical Massilia and modern Marseilles both have one thing in common, their intimate connection to the Mediterranean. The sea has always kept this port city’s gaze fixed southward towards that limitless, enchanting horizon. The Greek golden age of Massilia eventually ran its course. The city was slowly surrounded and finally consumed by the Roman Empire. The Romans co-opted and then built upon the foundations laid by the Greeks. The Greek and Roman presence can be seen most visibly beside the Centre Bourse shopping center in the old heart of Marseilles. Shopping complexes and ancient history may seem like a strange combination, but this is no ordinary city. The development of the complex inadvertently led to a major archeological find. In 1967 as the Centre Bourse was being constructed, the work revealed an eastern portion of Massilia’s ramparts in addition to a city gate. Roman dockyards were also unearthed in what archaeologists said was the best preserved remnant of a port’s facilities dating from antiquity. 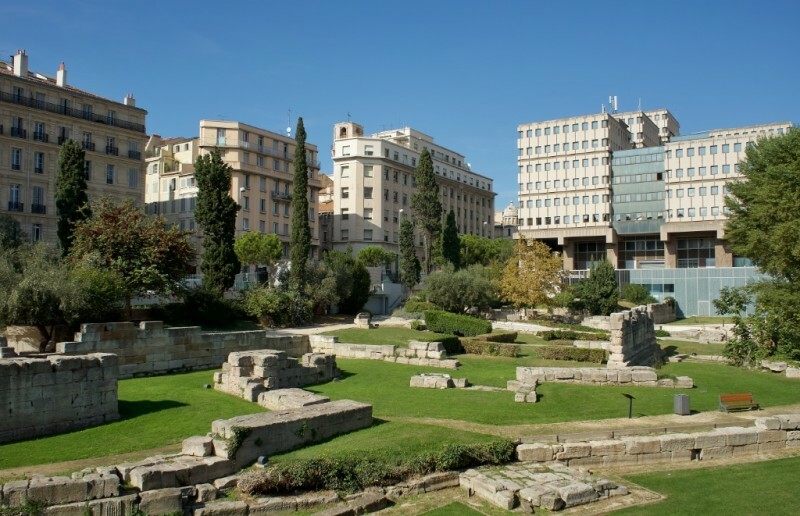 The city decided to protect these excavated ruins in the Jardin des Vestiges (Garden of Ruins) which is now an appendage of the Musee d’Histoire de Marseilles (MarseillesHistory Museum). A visit to the Jardin des Vestiges was a surreal experience for me. Looking down upon the ruins I could see the stone foundations of Marseille’s first port, two thousand plus years of history sprawling across the grounds. These physical, tangible relics of Massilia look small in comparison to their immediate surroundings. I could not help, but notice the apartment and office buildings, rows of modern structures that encircle the ancient port’s last traces. The setting showed little reverence for this splendid piece of the ancient past, other than the fact that it had been uncovered and left in situ. People walked by totally indifferent to this first iteration of their home city. Few of them taking the time to notice, let alone ponder, this stark reminder of Marseille’s very beginnings or the fact that one day all the surrounding development will also be reduced to ruin. The present eventually ending up just like the past, a future that few care to see.